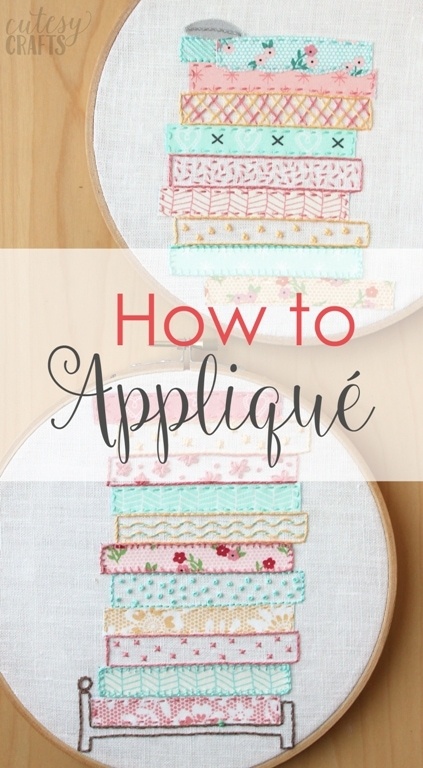 Since a lot of my projects include Appliqués, I thought I’d make a quick video to show you how to applique by hand. The word makes it sound so scary, bit it’s really very easy when you do it this way. You can make so many things with appliqué, from embroidery hoops to cute t-shirts. I just love the personal touch that an appliqué adds! If you find this post useful, make sure to take a look at my How to Embroider for Beginners series. Watch my “How to Applique By Hand” video below or head over to YouTube to watch it there. Hope you find it useful. Remember that whatever pattern you trace will be reversed when you cut it out since you iron the interfacing on the back. Hope that makes sense. Let me know if you have any questions about the process. If you are looking for the fairy tale embroidery patterns in the video, you can find those here. Also check out my other hand embroidery designs for more inspiration. Thank you for making this so clear. I appreciate you telling us exactly what you use & why. Thanks Barbara! Glad you found it helpful! I love this blog! Thanks for explaining the appliqué process. I will definitely try it. Oh, thank you so much Pam! It’s so easy to do! Do you iron directly onto your main piece of linen for your embroidery project? I’m trying this for the first time and I’m not sure if the applique will get messed up when I iron onto the fabric and then stretch it when putting onto a hoop. Yes, I just applique onto my main piece of linen and put it in the hoop. Haven’t had any problems. Make sure if you are using a water soluble marking pen/pencil that you don’t iron over it. Put any embroidery marking on after ironing the applique if you can.